We will visit Otavalo, home to beautiful Andean fabrics and the world famous indigenous craft market, the largest in South America. Visit Peguche, a village famous for its fabrics and indigenous looms where you can purchase beautiful weavings directly from the looms. Visit an Andean wind instrument store and workshop. Arrive at Magdalena, lunch. Stand face-to-face with people untouched by the urgencies of modern life. Taste the most authentic Andean home cooking. The taste of this hidden mountain niche can be absorbed in a series of optional activities such as horseback riding, mountain biking, or hiking up to the nearby hills. Dinner and accommodation Magdalena Community. Learn about their everyday activities such morning cow milking, shepherding and in season ox plowing. Breakfast. Travel south into the valley Cayambe, optional stop at Quitsato (entrance fee not included). And from there further south for some three-hour drive and visit Cotopaxi National Park. 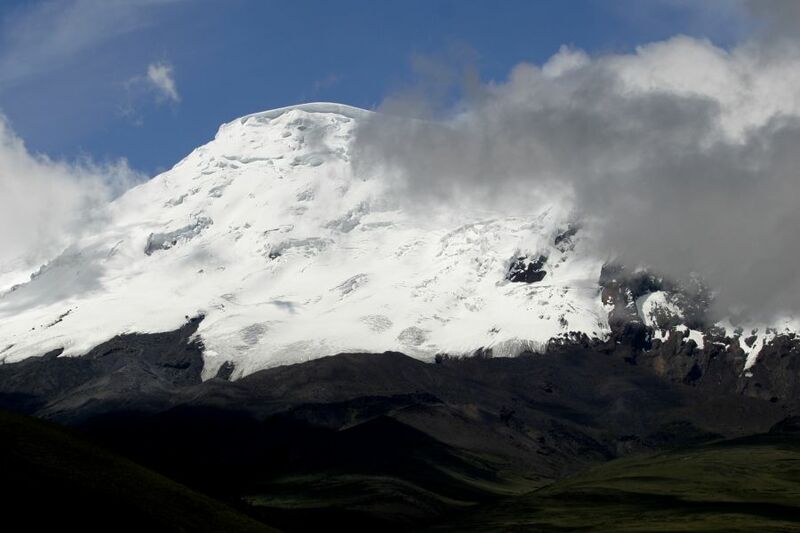 Cotopaxi (5,897 m) is the highest active volcano in the world. Despite the altitude, the Park is home to numerous birds and varied plant-like. Visitors will have the opportunity to enjoy some light hike for varied plant life forms and perhaps a few birds. Northeast lies Rumiñahui (4,557 m) and between the two mountains the plains of Limpiopungo. Lunch included. Visit a rose plantation (Monday to Friday), following the various steps of the production, from the hoop houses to the post-harvest room, a visit that will not be soon forgotten. Accommodation. Breakfast.Departing south for some three-hour drive to Riobamba passing cities like Latacunga and Ambato along the Avenue of the Volcanoes to reach the foothills over the western flank of the highest volcano in Ecuador, the snow-capped Chimborazo(at 20,702 pies, 6,310 m. above sea level).The reserve is devoted to the production of vicuna and shows the beauty of the Andes in full splendor. In the afternoon, we drive for around two hours to Riobamba and upon arrival take a panoramic visit touching the main plazas and churches. Local accommodation. Breakfast. From Riobamba we’ll go south to Alausí, along the way see Balbanera, the first Spanish church built in the country. In Alausí, we will take a spectacular train ride through the Devil’s Nose, a true feat in railway engineering of the early twentieth century. Box lunch is provided and then we continue south for some two-hour drive to visit the Incan Archaeological site of Ingapirca, which means "Wall of the Inca" and it is the most important Incan relics in Ecuador. This citadel was built in the fifteenth century on an ancient route that connected Quito to Cuzco. The Solar Temple and the surrounding buildings follow the system of construction found in the ancient Incan capital. Visit the archaeological site and also the site museum displaying pottery and metal artifacts found, not only at this site but also at the surrounding archaeological findings. We arrive in Cuenca by nightfall. Hotel accommodation. Breakfast. Cuenca is one of the most beautiful colonial cities in Ecuador and also a Unesco’s World Heritage Site. It is a city of facades dated from the last five centuries which have been kept intact due to the unique privilege of being the only city on the Ecuadorian Andes which has not been hit by major quakes. We visit the Cathedral, Main Square, the flower market, San Francisco and Santo Domingo churches and the Central Bank Museum with permanent archaeological, anthropological, colonial and republican art collections, including interesting photography documenting the city’s history. In the late afternoon, we visit a Panama hat factory where a wide variety of goods made from “Toquilla” fiber like bags, dolls and of course literally thousand possible hat styles, colors and prices. At the end, we shall have a panoramic look of the city from Turi viewpoint. Return to your hotel.